Company: Microrasbora rubescens (Dwarf red rasbora) is a lovely little shoaling fish that will suit any peaceful community aquarium. Aquarium setup: Microrasbora rubescens (Dwarf red rasbora) Prefers an aquarium with lot of open space near the surface and dense vegetation further down beneath the surface and on the sides of the aquarium that can serve as hiding places. Microrasbora rubescens (Dwarf red rasbora) should only be kept in schools. Feeding: Microrasbora rubescens (Dwarf red rasbora) will accept most food that are small enough for their small mouth. They accepts flake food. 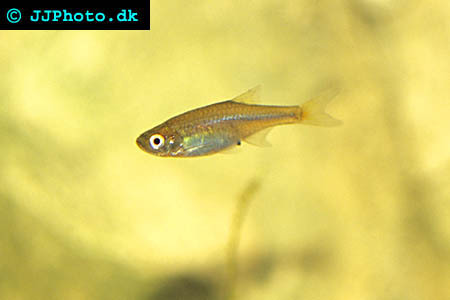 Breeding: Microrasbora rubescens (Dwarf red rasbora) males have a slender body While the females have a thicker body. Breeding take place in the vegetation and providing good spawning plants are essential for breeding this species. The spawn during the day and should be removed from the aquarium when the finished laying their eggs. Microrasbora rubescens (Dwarf red rasbora) are however not that prune to eat their own eggs but will do so if left for a longer time period in the breeding aquarium.